Thanks for being so sweet last week! I just adore y'all. While I believe I'm authentic on the blog (but still retain privacy), it's not always perfect peaches around here. Yet I don't want to be the blog that complains about everything/uses my blog constantly as a vent session. So it was nice to just let it all out and not apologize for it. One thing I will apologize for is my hair. It's the one splurge, the one thing I'm vain about. And I've been keeping pics of myself far away from the blog lately. When my beloved stylist quit, and then her replacement quit, I was in quite a pickle. I decided to dye my brown, highlighted hair. I'd never done it myself before, sans the occasional root touch up or glaze. I had to use the whole box. And it came out black with unintentional ombre on the ends. My grays stayed (I left it on longer than the directions stated). It looked awful. My boss said it looked "witchy" (it did). But thanks to Twitter reccs, I am madly in love with Dada Salon! Yay! It's impossible for me to do a whole shot of myself! Was this before or after? Guess! i think your hair is beautiful!!! I just had a serious hair problem very similar. I was trying to dye it back to blonde without stripping it, stupid, I know. So now my roots have a nice ombre thing going on too. I've got to go to a professional soon! Looks very comfy,perfect for a Friday! Your hair is beautiful! HAPPY FRIDAY!!! You should be vain about your hair A) I'm the same way and B) you have amazing hair. So sorry to hear about Sugar. I'm sorry to hear about your great grandmother. I'll be thinking of you and your family. i would guess that the picture is after (because it looks great). but more importantly, i'm sorry you've lost sugar! i know she means the world to you and you have a hard road ahead. i will be praying for you! I am so sorry to hear about your great grandmother. My great grandmother helped raise me and when she passed it was heartbreaking. It still breaks my heart to this day, and it was over four years ago. Love, happy thoughts, and prayers are with you during this difficult time. I'm so sorry about your Great Grandmother :( But you look beautiful and I love your necklace! I'm so sorry - I'll be thinking of you (and your hair, which, if that photo is before, I'm totally digging). If you still need a guest poster, let me know and I'll cook something up - a hair post, maybe? Oh honey, I'm sorry about Sugar. You're a strong lady though, hang in there! I'm so sorry about your great grandmother but I totally understand about being heartbroken and happy at the same time. Enjoy this time with your family because I'm sure that's exactly what she would want. Also - I don't know if your hair is before or after but I love it. It's sooo long! i hate it when stylists disappear and leave us hanging!!! hope you have a great weekend! So sorry to hear about your Sugar! Sending thoughts and prayers to your family! And your outfit is great, love the blue and white shirt. So sorry to hear about Sugar. I totally understand how you feel, about the happy and sad bit. I'll be thinking of you and your family. P.S. Can't wait to see how your hair comes out! This outfit is exactly the kind of thing I'm drawn to lately. You look adorable! I am so sorry for your loss, Elle. Take all the time you need, and know that I'm thinking of you with warm and caring thoughts. Big hugs, dear! So cute! And love the necklace especially! oh elle, elle, elle. you and sugar have been on my prayer list by name this past week. it saddens my heart that she's passed on. i will still keep you in my daily, private prayers. let me know if i can do anything for you or you need anything. you have my email. love you. You look great! I love that outfit! 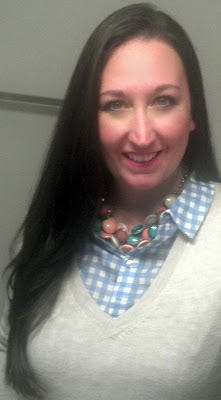 loving that gingham shirt. i think i have one somewhere in my non-pregnancy clothes. can't wait to whip those out after i have the baby!!! love your GS Lillian Hannah necklace. i have one too in green navy and blue!!! was it before or after with the hair! I am so, so sorry for your loss, Elle. Sugar sounded like an amazing lady, and I'm so glad you had her in your life. Take care of yourself. I'm so sorry for your loss! She lived a long life! I hate to continue this in the way I am going to, but I want to thank for visiting my blog! I have now a giveaway on my blog celebrating my 50 first followers. I wanted to let the people know who been to my blog few times a tip! I'm so sorry to hear about your grandmother. She sounds incredible. Lots of love during this difficult time. Oh, I'm so sorry to hear about Sugar. I'll keep you and your family in my thoughts and prayers. Sending you virtual hugs. ah your hair is beautiful, girl! id say after ... :D Anyways, love your blog!Hey, wanna follow each other? Following u already! Love your outfit and your hair looks so luxurious! I'm sorry about your great grandmother, you're in my thoughts. We saw my nanna this weekend, she's 90 years old. I love spending time with her. Your hair looks gorgeous doll. I'm so sorry about your grandma :( My great-grandma was 96 when she past. I know how devastating it can feel to lose someone who has been in your life forever. I forgot all about that song. Thanks for bringing me back! I'm so sorry about your great grandma. She lived a long and hopefully happy life! I'm so sorry to hear about your great grandmother! You'll be in my thoughts!